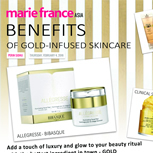 Geishas have long relied on the skincare benefits of gold to plump up and renew their skin. Gold? You might wonder. How can a material often used for making the most exquisite of jewellery be beneficial as a skincare ingredient? 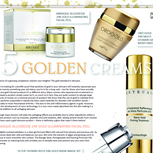 The Beauty Magazine - 5 Golden Creams. The price of a glowing complexion reaches new heights! The gold standard in skincare. 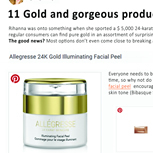 If you’re looking for scientific proof that particles of gold in your skincare will instantly rejuvenate your skin to twenty-something year old status, you’re in for a long wait – but for those who have actually tried any gold infused products it’s a different story. Many women who experienced a treatment or purchased a product simply swear by it, so much so in fact. Rihanna was onto something when she sported a $5,000 24-karat gold manicure back in 2012. 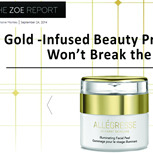 Now regular consumers can find pure gold in an assortment of surprising beauty products. The good news? Most options don't even come close to breaking a grand, much less five.